Sometimes, when I go back to Barcelona it’s a challenge to find new and interesting things to do in Barcelona. After living there for 7 years, I covered a lot of ground! Fortunately, I still have a few friends left there who point me in the right direction. 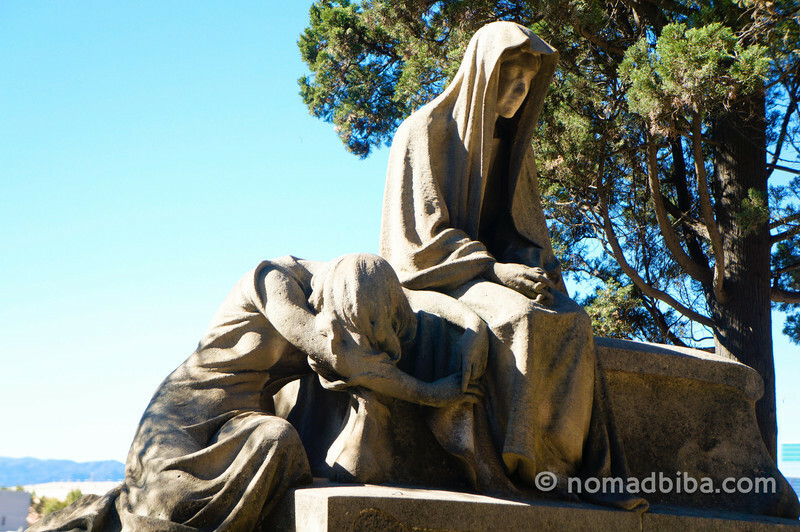 Last time I visited, we headed to Montjuïc’s cemetery for one of the free guided visits that are offered by the city on every second and fourth Sunday of each month. After wandering around looking for the tour’s meeting point, we managed to get to the small chapel, which is actually located near the entrance, in time for the introductory video. Montjuïc’s cemetery opened in the late 19th century as part of the efforts to deal with the growing needs of Barcelona’s population. Also, around that time there were important developments in the art nouveau and modernisme movements; and today, there are a few works that represent these styles. 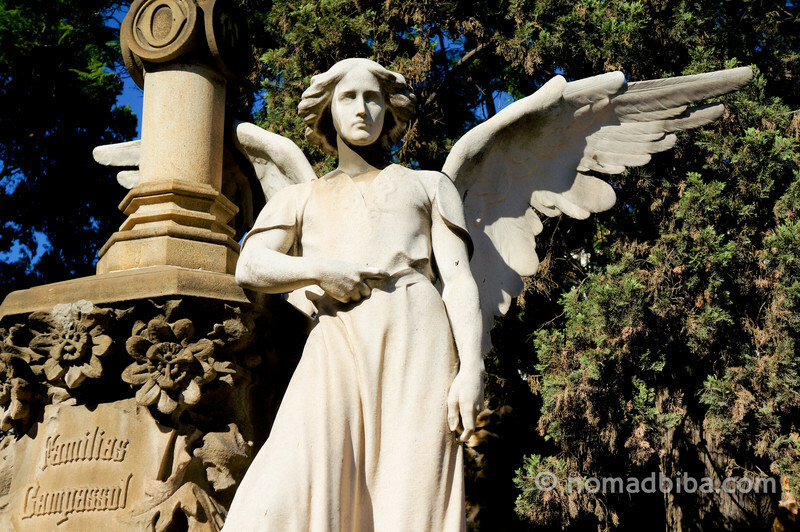 The tour starts at the lower part of the cemetery, also known as Paseo de Gracia, in reference to Barcelona’s most expensive street. Since there were no elevators at the time, people with money used to prefer the lower levels of buildings because they were more easily accessible; while poor people occupied the higher floors and attics, as they were hard to reach and much colder and hotter (depending on the season). This is also reflected at Montjuic’s cemetery, where the most spectacular tombs are in the lower grounds while the top of the hill is crowded with thousands of graves. In my opinion, one of the most impressive is the pantheon for the Batlló family, one of the most influential in Barcelona, which combines Egyptian and Germanic elements. As a curiouos note, our guide explained that rich families would normally work with the same architect that they’d hired to do their houses and have them build their family vault at the same time. In contrast, back in those days the cheapest burial option used to be the common grave with a price tag of three pesetas; the equivalent to a day’s salary for a blue-collar worker. On the other hand, besides the obvious class division between the rich and poor, Montjuic’s cemetery has different neighbourhoods for different people; for example catholics, protestants, jews, atheists, foreigners, and gypsies occupy each their separate grounds. At every corner, there are angel statues looking on at the living visitors and guarding the deceased. They come in different shapes and incarnations, some more graceful than others. Some of my favorites are the ones created by Josep Llimona, who is considered one of the top representatives of Catalan modernist sculpture. Also, in the cemetery there is a copy of one of his most notable works called Desolation (you can see it in the photo below) for which he received high praise. For more information about the guided visits, you can go here. Also, even if the visits are conducted in Catalan and Spanish only, there are actually 2 separate routes that can be done independently without a guided with the aid of QR codes; and in which the information is displayed in English as well. For more photos about my time in Barcelona, you should check my gallery. For more photos of Barcelona, check out my gallery. That is so interesting. Beautiful photographs. Also I am so jealous you lived in Barcelona for seven years. I’m desperate to visit. This looks amazing. Some people might find it strange looking around cemeteries but I find it really interesting. The statues are stunning. Thanks for your comment Sophie :) This visit was very informative and enlightening, it showed me a different view of Barcelona’s society. I rarely visit cemeteries when I travel, but now I’ll pay more attention to them. Hey did you need some sort of an authorization to take pictures there? I saw a sign that taking pictures wasn’t allowed. No, I didn’t get any sort of permit to shoot here. If photos weren’t allowed I think our guide would have said something; almost everyone on the tour had a camera. Very nice photos :) seems like we both have a passion to visit cemeteries for its beauty! Thanks :) Yes, after visiting the cemetery in Montjuïc, I’m more interested in seeing this part of a city. I think it shows a different side about the history of a place.